Justin was by himself at the Fifth Pubhouse, having a drink at the bar and watching the Raptors game, when the spirit moved him to the keyboard. 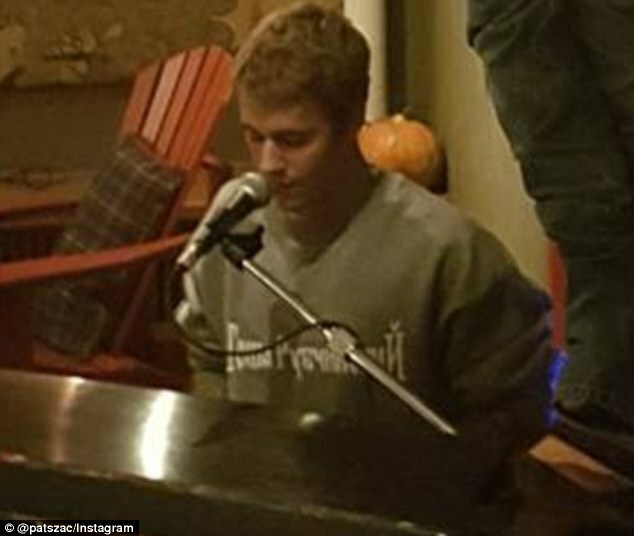 And Justin Beiber made sure he gave his fellow Canadians a night to remember when he tinkled the ivories at a pub in Toronto on Friday night. The 22-year-old pop pixie gave a Sorry performance, and also played a few of his other hits, as he showed his skills at the Fifth Pubhouse. The pianist proved to be popular with the regulars, and the cheeky young rapscallion was even treated to free drinks after his impromptu set, which included his version of Beatles classic Let It Be. This was surely a welcome perk indeed for the dinky chart star, as he was in the bustling Ontario alehouse to take in the latest performance by the Toronto Raptors.